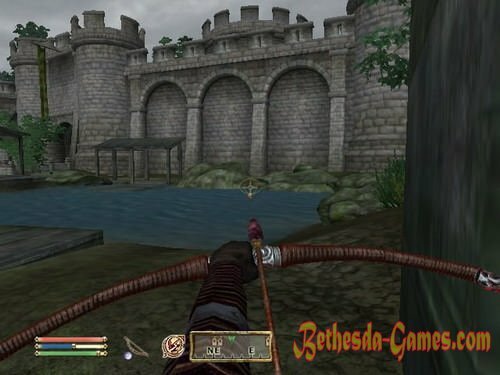 More to attract the attention of the Dark Brotherhood, you can also in the Arena. To do this, you must first complete the quest Grand Champion - Agronaka, solve the mystery of its origin, and then fight with him in the final battle. He will not resist. After his assassination will be the very inscription on the observation of unknown forces. Lucien Lachance will give you a knife - Blade of Woe, and require the fulfillment of an introductory task: to come to the tavern "Bad Sign" where to find and kill a man named Rufio. 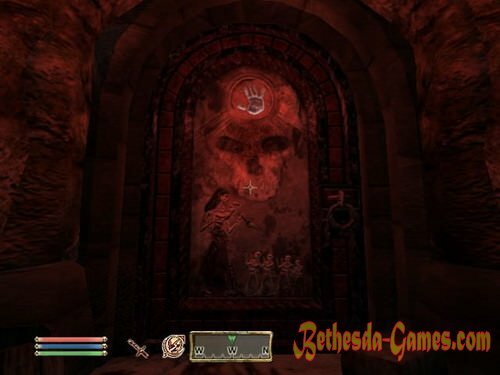 Only after that it will be ready to take you into the Dark Brotherhood. Rufio already elderly and sleeps all day, so his killing no problems arise. After his assassination is only somewhere to sleep, and Lucien Lachance again honor you with their presence. He will be satisfied with the work done, and then offer to visit the abandoned house that on the eastern side Cheydinhal, and open a door leading to the basement, saying the password is "sanguine, my brother!". On arrival in the shelter of the Dark Brotherhood need to talk to Ochivoy that after a short conversation will give you enchanted armor and stealth hood. In order not to enter into the Dark Brotherhood, simply do not perform the contract to kill Rufio. Or instead kill Lucien Lachance, then the road to the Dark Brotherhood will be closed forever. The following contracts will come from the vampire Vincent Valteri. Vincent Valteri say that he has a contract for the pirate Gaston Tussaud, who during his life had killed many people. Gaston Tussaud's is the captain of a pirate ship "Maria Elena", which is currently docked in the Waterfront. On the ship, you can get and "parade" entry, but must take into account that it is guarded by two sailors and the first mate, who will not hesitate to attack you, if you find yourself on the deck. Fortunately, there is a second way of getting inside. You can get a hold of one of the boxes, which are found in abundance around the ship. One of them is open and empty, as they approach it pops up a plaque with the question of whether you want to get into the box. Respond positively and soon will take the box into the hold, where you can start searching for the captain's cabin, where Gaston Tussaud. After the murder of the captain at the door immediately begin to knock the other sailors, so vividly grab the key from the body Tussauds and go through the door to the bridge (it can and crack). After the murder of the captain to get back to the sanctuary in Cheydinale and get Vincent Valteri award - Ring "Black Ribbon" (gives protection from magic skills and increases the breaking and light armor). The cabin Gaston Tussaud's in a pot growing root Nirn required for the quest "in search of their roots." Black Ribbon - tiered thing, so it might depend on the level of the player. Vincent Valteri say that this time you need to go to Broome and kill wood elf named Benlin. But it should look like an accident: do not kill Benlina conventional methods (stab, shoot, etc. ), and you can not kill his bodyguard Thunder. For staging an accident you must get into his house and loosen the mounting beams that hold the Minotaur head hanging over your favorite chair Benlina, where he likes to sit from 8 to 11 pm. It is better to advance to penetrate into the house at night Benlina when he and his bodyguard Thunder sleep, broke the lock on the main entrance door. The second option - is to get through the basement, the entrance to which is on the back of the house. Either way, once inside the building, you need to get into the attic through the room on the second floor of Thunder, where there are mounting beams, keep your head minotaur. There should lie low and to waste time until 8 pm, when Benlin will sit in his favorite chair, and then loosen the beam, resulting in a head will crash down, nailed accident. Get the job done, we can only get out of the house by an alarmed Thunder and submit a progress report to Vincent Valteri that will reward gold and enchanted elven knife - Spike Anguish (enchanted by the reduction of health and exhaustion of force), if the job is done exactly as instructed. And will increase to Killer. Spike Anguish - level object. This time is necessary to kill Dunmer named Valen Dret, which is in the imperial prison (the same Dunmer who mocked the protagonist of the next cell). 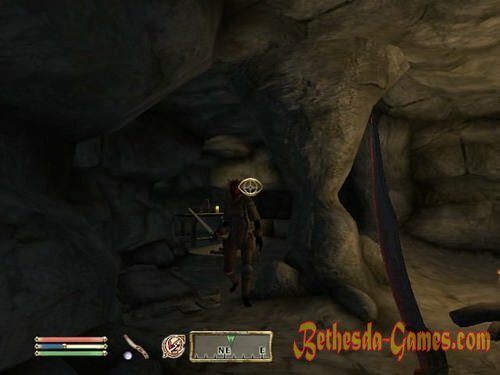 According to Vincent, to get into his chamber will be through a network of tunnels connecting the imperial prison with sewage. Vampire gives the keys to the locked manhole located at the prison wall, saying that this network of tunnels already took one prisoner in the recent escape. However, to kill is only Valen Dret, so to get the rewards are not worth killing imperial guards who patrol these tunnels. And best of them all in the eyes do not fall, because the guards set is not very friendly to intruders. On opening the grill, get into the sewer system, which is inhabited by rats, goblins and gryazekraby. Passing them soon find ourselves in a tunnel, which at the time made an unsuccessful escape Uriel Septim VII. Only now these tunnels are patrolled by the Imperial Guard. It is better to avoid collisions with them, hiding in dark corners, which abound here, and quickly run through clarified portions. In the end, we find ourselves at the end of the path in the same chamber, from which in the beginning of the game and made their escape. In the cell opposite is still our old neighbor - Valen Dret. The key to his chamber is close to the table (in the same key from the front exit), but you can just shoot him. After this mission, get out of the imperial prison and go to Cheydinhal. For a job well done Vincent Valteri award a cash prize and a ruthless justice weights (increased strength, intelligence and agility and reduce charm 2 points). If in the process of passing at least one guard was killed, you do not get the balance. The tunnel, which gnawed rats and used the first escape, will be boarded up and reuse it - it is impossible. This job is different from those that you have received before. At this time it is not necessary to kill anyone, but only to stage the death of a man named Francois Moterr who owed a large bag of money bad people, so they sent him a murderer. Vincent will Valteri knife poisoned wine weaknesses, with which to dramatize death Moterra and antidote. Go to Chorrol and find the house locked Francois Moterra. After working a little bit master key, run inside, where we are waiting for Francois. He'll tell you that soon will be a killer here - hiding-your-heart, and his eyes have to "kill" Moterra, then you need to wait one day, when his body put up in the basement of the chapel Chorrol, for everyone to see. Thus planted killer must stay alive so that he could go back and tell his superiors that Francois was dead. Soon will be a hiding-your-heart, who will be surprised by your presence. In his eyes we put Moterru blow a poisoned dagger, and then hiding-your-heart immediately attack you. You need as quickly as possible to leave the city, on the street long stay is not necessary, since the guards immediately rush to defend you and can kill Argonian-assassin. However, after leaving Chorrol, after 24 hours should go back to it and visit the basement of the chapel, where you can find Moterra weakened. After applying it antidote he comes alive and says that we must get out of here, but that's buried in the basement of his ancestors, who considered "resurrection" Moterra insult to their graves, and now want to deal with him personally. We'll have to clean up the basement of the family resurrected, and then help Moterru get out of it and carry it to the tavern "Grey Mare". After Moterr intact will be delivered to the tavern, back to Vincent Valteri and receive from him the amulet "Cruel Heart" (Increase Strength and Willpower), the key to a well in the sanctuary and the new rank - Liquidator. Vincent Valteri no more contracts for further work should refer to Ochive. We have a contract Ochivy murder Feliana - high elf that lives in the Imperial City. However, the terms of the contract require his assassination in a secluded, secluded place without witnesses. Arriving in the Imperial City, it is worth to ask around about him from passers-elven nationality. If they have a good attitude to you, they will tell that Felian lives in the Talos Plaza, at the hotel "Tiber Septim." Once there, it is necessary to talk to the head of the hotel, in which we learn that Felian - junkie hooked on skuumu and lost everything he had, besides his beloved - Astraeny, which pays for everything. You can talk to Astraenoy, and if its location to you is high enough, it will share the problem and tell you that watched Felianom and learned that he comes for a few hours in an abandoned house Lorkmira that in the Elven Gardens. This information can be obtained in another way - from the mouth of the Feliana if your inventory has skuuma. If you otdatite Felianu it, it will take you as a friend and tell about his hiding place - home Lorkmira, where he runs a few hours, take skuumu. Everything else he will give and the key to this house. After receiving the information, comes to the house and wait for the arrival of Lorkmira Feliana, where he will find his own death, away from prying eyes. Go back to Ochive and get their awards and prizes in the form of a bow, "Shadow Hunting", capable of reducing the health and magic of the victim, as well as reduce the resistance to poisons and scare undead. Shadow Hunt - level object. If you have filled up the previous job Vincent Valteri (was killed hiding-your-heart or Francois Moterr), the rank of the liquidators and the key to the well after you get this quest from Ochivy. This time the goal is a squad of mercenaries, more precisely, their leader - Roderick. Recently, he picked up a strange disease, and now resides in a lethargic state in Fort Sutch, while his life is only supported by special drugs. Contract terms require that all looked like Roderick died of his illness, so Ochiva issue of counterfeit medicines that need to replace the present. In the course of the assignment is not necessary in making his mercenaries guarding Roderick, for a staged process of poisoning fail and have to kill Roderick simple methods (which is at odds with the plan). So, go west to Fort Sutch. Find the door and go inside. On the right side should be a small locked grating, which should be a hack, that will help a secret passage to pass the guard on duty at the gate. Going further down the aisle and cracking a lattice on the other hand, we notice two mercenaries, talk to each other. Quietly sneak past them and, after a little more on the stairs and corridor, soon find ourselves about medicine cabinet for Roderick. Change the bottle and get out of the fort. Back in the sanctuary Cheydinhal and receive from Ochivy its monetary reward and finery cheater, increasing the charm and eloquence. Finery fraudster - tiered thing. From Teynaavy can learn about the secret passage leading to Fort Sutch. Fort Sutch was a famous fort of the Second Era, mentioned on the cards since the first guidebook. This time required to infiltrate the mansion Sammitmist that Skingrad where, pretending to one of the guests, it is necessary to eliminate the other partygoers. Guests gathered in one house in order to find a chest of gold hidden somewhere in the house. Naturally, no chest there, and guests owner of the mansion lured with one purpose - to kill them all insults that each of the guests gave him in the past. 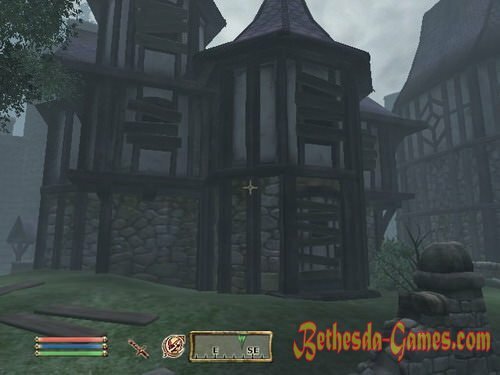 Go to Skingrad where we were waiting for the doors of the mansion butler Fanfan, who would also be the agent of the Dark Brotherhood. He will give the key to the door and say that it is impossible to get out of the house until all the guests are dead. To receive the award, you need to remove each of the guests quietly, so that others did not know who the killer is. Matilde Petit can be killed by logging into her confidence and inviting look of the house chest of gold. Primo Antonius often spends time in the bedroom on the second floor, so its invisible murder no problems. The second option - to leave it for last, with Neville, then soldiers will begin to suspect Primo in atrocities and attacks him. So can do other guests, but only if they have a fairly high to you location. Neville, like Primo, loves to sleep on the second floor, which is not difficult problems with its removal. If the location you sufficiently large, then after killing two guests he would say that he would go upstairs for their equipment. Nelsen. If you talk to him after the murder of three guests, he will say that he needs to get drunk and run to the basement in search of mead, where it can kill quietly and without witnesses. Dovesi Dran. She loves to sleep on the second floor. With the high location can persuade her to sleep or go down to the basement, when someone dies from guests. When the survivors will be only two guests at a high location to you, they begin to suspect each other, as a result of any of them will begin to attack the second guest, considering it a real killer. This time, it's time to put an end to Adamus filidh - Captain Imperial Legion, constantly interfering activities of the Dark Brotherhood. But now he has retired and lives in Leyaviine, but the Dark Brotherhood will not let him get away with impunity. For this purpose, you will be given Sithis Rose - magic arrows designed for instant murder particular purpose. In this case filidh, but it would kill the arrow only in the case if there is no reservation. To receive the bonus you need to cut off the dead man's Adamus finger with a ring-signet and put on the table his successor as head of the Imperial Legion, as a sign that the Dark Brotherhood to be trifled with. Go to Leyaviin searching Adamus filidh. The captain is often bathed in a small lake near the barracks, which is typical, without armor. Having hidden among the houses, wait for the moment when filidh climb into the lake to bathe, and send him greetings from the bow - arrow Rose Sithis. Once Adamus die, swim up to his lifeless body and cut his finger with a ring. Now you need to be sent to the Imperial City and put the finger in desk at the office location Adamus. The only problem is that at this table in the office sitting captain of the guard, and ingress - punishable, so it is advisable not to catch the eye. It is better to go through the dining room in the barracks, and then get into the office through the door that connects it to the dining room. So it will be less likely to be detected, due to the fact that the captain will find ourselves behind. Putting a finger in the desk, back to Ochive and get their cash prize and an additional cash prize of 500 coins for the "gift" left by the Legion. Adamus filidh can kill without the aid of Roses, by simple means, but the effectiveness of this method is significantly lower. After talking with Ochivoy you receive from her a sealed letter - a personal order from Lucien Lachance. The letter states that the matter is urgent and necessary to meet personally Lachance at Fort Farragut, near the north-east of Cheydinhal. Go to the fort. Inside the fort there are Dark guards and traps, so to meet Lachance have to wade through them. The second option - to use the back door Lachance, hatch, which is located in the crown of half-rotten tree east of the fort. Now we are working on the Black Hand. Lucien Lachance says that among the members of the Dark Brotherhood has hidden traitor. Lucien will say that it is certainly not you, as there were in the Brotherhood as recently as a traitor act for quite some time. 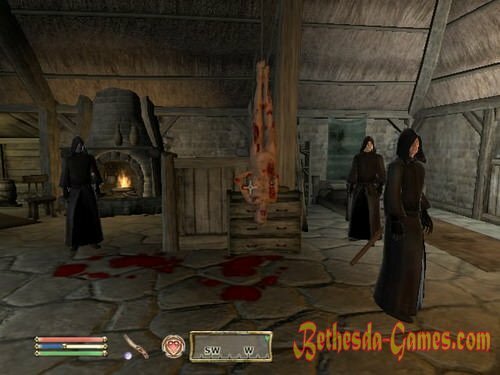 To ensure the integrity of the Dark Brotherhood, have to spend a rite of purification. To do this, you must return to the sanctuary in Cheydinale and kill everyone who is there: Ochivu, Valteri Vincent, Marie Antoinette, Gogrona Gros Bolmoga, Telaendril, M'Raazh Dara and Teynaavu. Who is the traitor - is unknown, it is known only that he would be killed in the process of cleansing of the sanctuary. For this purpose, Lachance gives poisoned apple and a roll call ghost Rufio. Go to the sanctuary. Apple should put on the table or in the cupboard with food, first removing the rest snack, or throw someone in the pocket. Maybe someone and covet this suspicious fruit. People will eliminate one by one in the living room, when they sleep (you can try to rob them at this time, depriving the weapon or armor), or in the training room (better when there is someone one). If you have problems, call to help a ghost Rufio. After all 7 members are killed, Cleansing completed. Back in Fort Farragut and talk with Lucien Lachance. He will make you rank in your own Strangler and say that from now on all contracts will only come from a special cache. And also give immortal magic horse - Shadow mane. In the office in a locked barrel Lachance are ten poisoned apples. Next contract is in hiding in the cavity mossy rocks on top of heroic Hill. The cache is a note on a mission: to go into the cave "rotten leaves" and kill the necromancer Seledena, which began to turn themselves into a lich. The process of transformation is not yet complete, but Seleden already strong enough, so in direct opposition to fight with him will be difficult. Inside the cave guarded by undead, you can find the book "The Way to Excellence" is a diary Seledena. It says that it has placed its vitality in a special vessel - "Sand determination", at the time of becoming a lich. Therefore, for the murder simply steal the vessel out of the pockets Seledena, causing it to lose its vitality and die. After performing this task should go to Chorrol for the next contract being in a bag under the Great Oak. Next contract is to kill all the members of the family Draconis - Perrin, Matthias, Andreas, Sybil and Kael. However, we know only the location of the Perrin Draconis, which is located on a farm Eppluotch, near Broome. Go there and talk to Perrin Draconis. Answer her look her children, and she will take you for a courier who had hired to deliver gifts to your children, and will give a list of the location and the rest Draconis 100 coins. Special problems with a fix not. You can not talk to her, and the list just remove the corpse. Matthias Draconis lives in the Imperial City, near the Talos Plaza. It is best to kill when he is alone or at night in his house when he sleeps. Andreas Draconis manages tavern "Drunken Dragon". Inside the tavern there is a guard of the Imperial Legion. You can try to fix it quietly, and it is possible to have a conversation with him, saying he killed his mother. Then he will throw himself shouting at you, and the guard will be on your side and help you kill him as "instigators of the riots." Sibbila Draconis dwells in a cave "Dirty Valley." In addition to her cave inhabited by more unfriendly different beast. Sybil herself is also not particularly pleased to your visit and will begin to attack, barely seeing you. Kael Draconis. Here and begin the main difficulties. The fact that Kael - Leyaviina officer guards, so just kill her did not succeed. You can try to throw it into the pocket of a poisoned apple, but the chances that it will eat it, not high. So we have to torment her, and in the end - to pay a fine. After the murder of the whole little family, go for a reward and next contract, hidden in a well in the courtyard of the castle Skingrad. If you pass in front of this whole plot Thieves Guild, the penalty for killing Kael can be avoided by committing murder in the hood Noktyurnal. All sins will be on the Grey Fox. After the murder of the whole little family on the farm will Eppluotch their graves. While reading the inscription on the tombstone of bringing you attack its Troubled Spirit. Next victim - haadzhit Zh'Gasta. He - the master of martial arts living in Broome. Zh'Gasta expects attacks and bribed the guards, so they do not interfere if the fight will come on the streets. Go to Broome and find the house Zh'Gasty. Usually it is in his secret training room. Trying to talk to him to anything good will not, so the faster will deal with the Khajiit, the better. After his assassination to visit next hiding place - the rotten box under the old bridge, which is south of the Imperial City, where the put and take the award and a new contract. Of the contract know that the next victim - hunter-argonianka named Shalizi, located in the "flooded mine." Mine lives up to its name, so you have to go for a swim. She's a little touched by the intellect, so I attacked. Argonianku to kill better lure to land. Make the case go for the next contract - in his grave at Fort Redman. This time required to kill a wandering merchant Alva Uwan traveling around Cyrodiil. The cache is also a schedule where he normally does. We have a pretty strange Uwan allergic to honey, it is worth it to try this drink as paralysis. You can try to throw in his pocket a bottle of mead or replace all the alcohol at his home in Leyaviine honey. Better to kill him in his own house, or during his travels between cities without prying eyes. After Alva Uwan is dead, go to the next cache while it is in the shopping district of the Imperial City, in a hollow tree stump behind the store "Strong Shield". Next victim - Halvisten-frosted Blood, living in his small camp on the mountain top Gnoll, west of Bruma. It is best to kill him when he was sleeping in his tent. The only problem - it's his watchdog. Disposing of the two, go to the next cache, located on the bottom of the lake in ruins Nornala. Now you need to remove the wood elves on behalf of Angola, who lives in Bravil. It is known that Angola visited the statue of "Happy Old Women" every day between six pm and the hour of the night. And there should be an ambush. Climb to the roof of the nearest house, and wait, when the statue is suitable Angola. After it appears in sight, send him an arrow. About the intervention on the part of the guards can not worry - Angola had been warned about the danger and bribe them, that they did not intervene in the battle. When Angola is dead, you can go for the next contract in Anvil. Only you will not get far. Immediately after the murder Angolima you intercept Lucien Lachance, who is very evil look. He will begin to reproach you in madness and betrayal, and say that he had come to put an end to all this. Soon, however, Lucien Lachance aware that you do not understand what happened, and explain the situation: after the murder Draconis contracts remained untouched, and you personally kill the speakers and their stranglers, and now killed and Angolima - the most listener. Black Hand believes that this Lachance let an order to murder, and she is ready to kill him. Lachance is sent to the farm Eppluotch, and we need to track down the person who substitutes contracts. To do this, go to Anvil, where you need to lurk in barrels that about the statue in the pond, and wait for someone to enclose orders. After a while you will see that the solution to the barrel Bosmer named Enilot and puts back a note. We run out of the ambush, and talk to him. He says that he knows nothing, but for to leave this piece of paper, he paid a "man in a cassock", who lives in the basement of the lighthouse, the key to which is at Ulfgaroma Misty turns - a lighthouse keeper. Find Ulfgaroma and demand the key from him. Any answer that works for the Dark Brotherhood. That gives it quickly, because he does not want any problems. Go to the basement and open the door. Inside the basement pool of blood and a bunch of rotting corpses. The only living creature - a mad dog that will not hesitate to attack you. Inside the room was a table, on which the dead head, as well as blog "a man in a cassock" (by appointment becomes clear that he is a madman). Thus, it becomes clear that the traitor tricked Black Hand. He was killed during the cleansing of the sanctuary, moreover, it is also Purification and provoked, and then he substituted contracts Lachance, using us as a means of destruction of the Black Hand. With this diary Eppluotch go to the farm. However, upon arrival we note that all efforts are in vain. Members of the "Black Hand" made it to the first Lachance, and now his mutilated corpse hanging tied by the legs to the ceiling. To the right you will approach Arkuen and say that the traitor is dead, he is all the time fool you, and you will no longer fulfill its contracts. She will ask you to place the speaker and will give the mantle and hood of the Black Hand. Following this Arkuen say again to talk to her the next time between midnight and three o'clock in the morning. Of who is a traitor, you can guess another farm Eppluotch. It's enough to pull off the head from the basement to the lighthouse, and then on the farm to talk to all speakers of the Black Hand, pre-throwing his head on the floor. One of the speakers will give themselves to their strange conversation. Only on the subject will not be affected in any way. Between midnight and three o'clock in the morning talking with Arkuen again, and she tells us that it is time to visit the Night Mother, so that she appointed a new listener. Go to Arkuen in Brava the statue Happy old woman. Yes, Bravo and residents do not realize near what they live. After Arkuen utter a spell, the statue will decrease in size and opens a secret passage in the crypt of the Night Mother. However, the specter of the Night Mother unhappy with the situation. She reported that Lachance faithfully served Sithis and traitor is here, in this crypt. Then he will reveal itself - it Mathieu Belamon. Quickly hit it with a knife kill two adjacent speakers and threw it on the Night Mother. The task is simple - to kill himself Mathieu. Once a traitor die, Dark Brotherhood nothing more nor threaten, although all of the speakers were just you and Arkuen. It remains only to the Night Mother called the new listener. It picks you up at the office, and at the same time said that she was aware of plans Mathieu Belamona, but did not inform his previous listener as he was incompetent, allowing such oversight. After that, the Night Mother offer to release the true power of the Blade of Woe, with the result that he will be fascinated to demoralization, decreased strength, health and magic. After that, it will take you to the sanctuary in Cheydinale. The Blade of Woe - level object. Now you - listener. 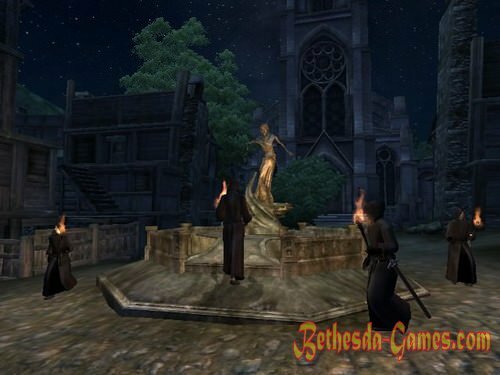 You are required to come once a week to the statue of the Blessed Old Women and the Night Mother will report a list of people who need the services of the Dark Brotherhood. To announce the names of customers Arkuen, and she says that it will send to the speakers, and we will issue our weekly earnings. In the sanctuary soon there will be another three killers, who are willing to accompany you in traveling. New skeleton also appear.